Photographer is B. B. Tiffany of Indiana, Pennsylvania. 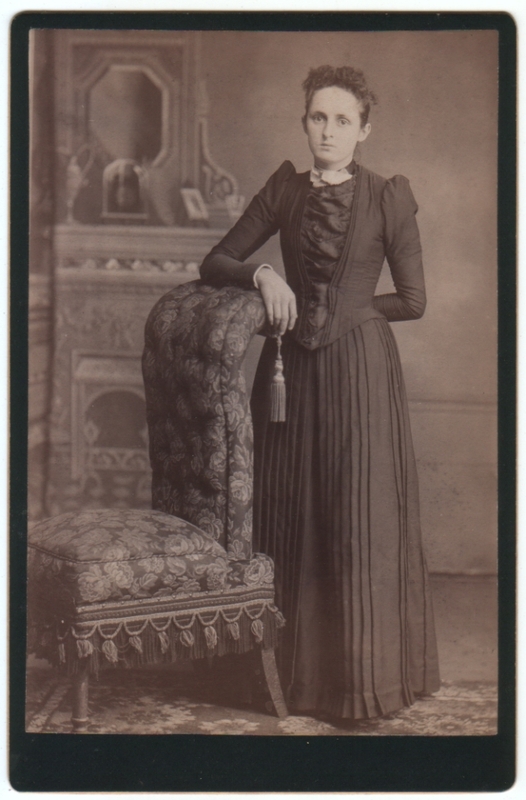 The photographer’s plate on the back is printed with the date 1891. She has such an uncertain look on her face. That chair is too tall for her to lean on comfortably. The puffy shoulders of her dress inadvertently accentuate the natural frailty of her frame. I just want to give her a sandwich and tell her everything will be okay. Back then people could not move during the long exposure and there were devices in place to hold someone’s head in place. Perhaps that is why she has such an unhappy look about her. Then again, life was pretty damn hard in 1891. You want to give her a sandwich? LOL. I want to get her drunk. LOL! It’s a deal Matt! B.B Tiffany is my great great grandfather! Most of the pictures were very serious…but there are some that seem more natural as well. Thank you for your comment. How wonderful to hear from you! You’re the first person who has stated any personal connection to one of the pictures I’ve posted. It must be such a treat to find his photos online. I assume you have samples of your own? I like this one a lot, and am glad to have it, though, of course, I know nothing about the photographer or the subject. If I find any more by him, I’ll be sure to let you know. have you heard of an artist called Remedios Varo? I think that’s the spelling. This gal looks like she came out of one of Varo’s surreal paintings. Hey Susan! No, I hadn’t. I Googled her, and I see what you mean. There is a faint whiff of the surreal about our gal here.